It’s estimated that around 1-in-15 people suffer from sleep apnea. Although the numbers seem grim, the good news is that about 80% of them only have mild-to-moderate sleep apnea, which may be helped with a simple oral device made in our Parma dental office. There are three types of sleep apnea: obstructive, central, and complex. Each one is characterized by difficulty breathing while asleep, but they differ in the mechanisms that cause the difficulties. Obstructive: Obstructive, as the name implies, occurs when something blocks the airway. In most cases, it happens as the result of the tongue collapsing against the soft palate and/or the soft palate collapsing against the back of the throat. This is fairly easy to recognize because people who suffer from obstructive sleep apnea tend to snore loudly as the tissues vibrate. If the airway becomes significantly blocked, the individual may wake up and gasp for air. Loud snoring can also keep the person and their loved ones awake at night. Things like genetics, allergies, and carrying around extra weight will increase a person’s risk for the obstructive form. Central: Central is different because it’s not caused by tissue collapse, but rather, the brain stops telling the body to breathe. A person who suffers from it may wake up gasping for air as much as several times an hour, never really falling into a deep and restful sleep. This form is caused by things like strokes, severe obesity, brain infections, and neck conditions. Complex: Complex sleep apnea is a combination of the other two forms. 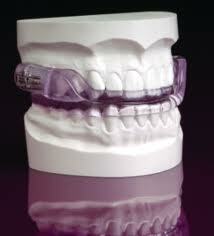 Mild-to-moderate obstructive sleep apnea can be treated with a simple oral device provided by Dr. Gecovich. The device gently pushes your lower jaw slightly forward to allow for better airflow, which also results in quieter, more restful sleep. More serious cases will still need to be treated with a CPAP, though the vast majority respond well to wearing the device nightly. Obstructive sleep apnea can have some serious consequences if left untreated and can diminish your quality of life. If you snore or believe you have it, Dr. Gecovich will work with your physician to find out which form of sleep apnea you suffer from, and determine if an oral device will work for you. To schedule a consultation, please complete our online form or call our office.